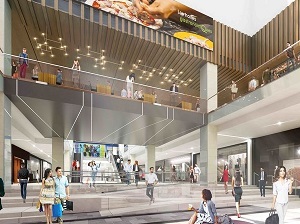 The new food court will be a centerpiece of $200 million in renovations to the Eaton Centre Montreal, a downtown Ste. Catherine St. landmark which hosts more than 30 million visitors annually. Ivanhoé Cambridge has yet to announce any of the stakeholders in the Time Out Market, but the concept is based on drawing in top local restauranteurs, chefs and other dining- and beverage-related businesses. It is a far cry from a traditional shopping mall food court. Time Out Market Montréal will include a curated mix of 16 food offerings, two bars, a demo kitchen, a cooking academy, a retail shop and a cultural stage. “Time Out Market Montreal will bring the best of the city together under one roof: its best restaurants, bars and cultural experiences, based on editorial curation,” Ivanhoe Cambridge says in a release announcing the market. Time Out Market is part of Time Out Group, which has signed its first management agreement with Ivanhoé Cambridge for the facility. “Montreal has developed into a culinary hotspot and is now one of the world’s foodie capitals. This is a city with incredibly creative chefs and an audience with a love for great food,” said Didier Souillat, CEO of Time Out Market. “As if this wasn’t enough, Montreal also has a buzzing cultural scene with over 100 festivals each year. Time Out Market Montreal is following the successful culinary phenomenon Time Out Market Lisbon, which opened in 2014 with 26 restaurants, six kiosks, eight bars and cafes, five shops and a cooking academy. With 3.6 million visitors in 2017, Time Out Market Lisbon is Portugal’s most popular attraction, making high-quality fine dining and cultural experiences accessible to all. In March, it received an international award recognizing it as one of the most visionary concepts in the European food service sector. The renovations at the Eaton Centre are part of a larger, multi-year investment of about $1 billion in downtown Montreal by Ivanhoé Cambridge at several of its core properties. Time Out Group is a global media and entertainment business with a content distribution network comprising digital, mobile, apps, social media and print, and a physical presence via Live Events and Time Out Market. Using these platforms and its global brand, Time Out enables people to make the most of a city through curated content around food, drink, music, theatre, art, travel and entertainment. Time Out, headquartered in the United Kingdom, is present in 108 cities in 39 countries and has an average global monthly audience reach of 217 million. Ivanhoé Cambridge develops and invests in real estate properties, projects and companies in dynamic cities around the world. Vertically integrated in Canada, Ivanhoé Cambridge invests internationally alongside strategic partners and major real estate funds. Through subsidiaries and partnerships, it holds interests in more than 1,000 buildings, primarily in the residential, office, retail, industrial and logistics sectors. Ivanhoé Cambridge held more than $60 billion in assets as at Dec. 31, 2017. The company is a real estate subsidiary of the Caisse de dépôt et placement du Québec, one of Canada’s leading institutional fund managers.